Do you already own a photo camera and would like to create impressive pictures of the night sky with the help of the long exposure or even make time-lapse pictures with little effort ? The BRESSER photo mount is the ideal base. 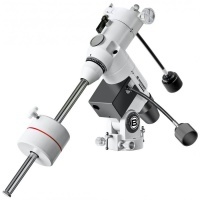 Not only for beginners in astrophotography, this mount is particularly well suited, but also the experts swear by a compact and easy-to-use mount to automatically compensate for the natural rotation of the earth. The BRESSER photo mount is designed for a camera with lens of max. 2.5 kg total weight to carry and track. Large aperture, wide-angle lenses are ideal for the beginning, because the requirements for tracking accuracy accumulate with increasing focal length and exposure time. 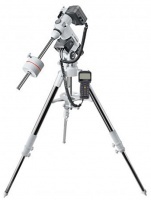 The Bresser Messier Exos 2 Goto Mount is fully featured equatorial Goto mount, capable of carrying instruments in the 3-5-inch class (refractors) or 5-8-inch class (shorter focal length reflectors and catadioptrics).